MAMMOTH WORLD A Columbian mammoth (Mammuthus columbi), an American mastodon (Mammut americanum) and a gomphothere (Cuvieronius) were among the prehistoric elephant relatives that roamed North America and Eurasia until the end of the last ice age. The Gray Fossil Site, a sinkhole in northeastern Tennessee, is full of prehistoric treasures. Between 7 million and 4.5 million years ago, rhinoceroses, saber-toothed cats and other creatures, even red pandas, perished here by the edge of a pond. But that bounty of fossils pales next to the site's biggest find: a mastodon's skeleton, nearly 5 million years old, preserved in exquisite detail all the way down to its ankle bones. "It is just fantastic," says Chris Widga, a paleontologist at East Tennessee State University in nearby Johnson City. The ancient elephant relative became known as Ernie because it was enormous, calculated soon after its 2015 discovery to have weighed 16 tons in life. The name came from musician Tennessee Ernie Ford, known for the coal-mining song "Sixteen Tons." Since then the researchers have revised the mastodon's weight down to 10.5 tons, says Widga, but the name stuck. Ernie is still the biggest mastodon ever found in North America. He would have dwarfed today's large African elephants, which average up to six tons. Excavators are working to dig up the rest of Ernie's bones before this winter, with an eye to reassemble the ancient beast, the researchers reported in October in Albuquerque at a meeting of the Society of Vertebrate Paleontology. Ernie is a jaw-dropping example of the ancient elephants that once roamed Earth. Scientists have found the remains of mastodons and their relatives, the mammoths, throughout the Northern Hemisphere - from huge tusks buried in the Alaskan permafrost to mummified baby mammoths in Siberia (SN Online: 7/14/14). 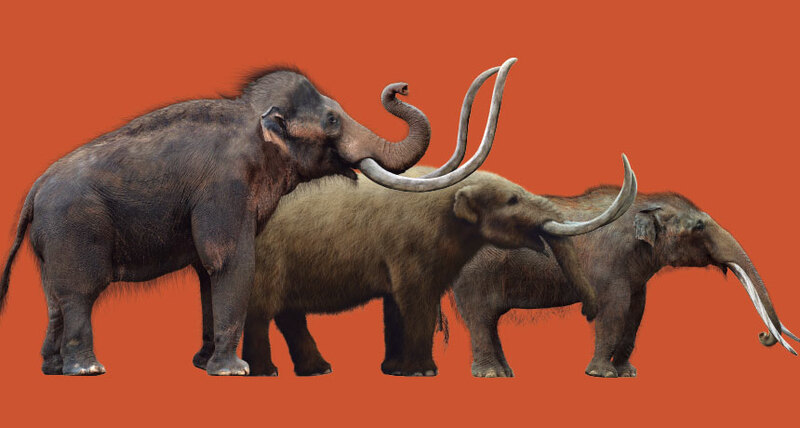 Now, researchers are knitting together these scattered discoveries into a more coherent picture of the lives and deaths of mammoths and mastodons. Scientists are exploring what plants these megaherbivores ate as they rambled across the landscape, and how they competed with other animals - including humans - as climate changed and the last ice age ended some 11,700 years ago. Clues to these mysteries lie in ancient teeth and bones. Tiny scratches on the teeth of mastodons from North America suggest that they ate a surprisingly varied diet of grasses, twigs and other plants, depending on their environment. A recent analysis of the chemistry of European mammoth bones reveals that those animals probably struggled with dwindling food sources as the climate warmed, which probably hastened the animals' demise. Excavating some of the last known sites where mammoths and humans coexisted points to how early Americans gathered around a kill, making the most of the giant carcass to feed themselves. Scientists hope to better understand the extinct elephants' role in ancient ecosystems. "How did these big herbivores respond to climatic shifts, both before and after humans arrived?" asks Hendrik Poinar, a geneticist and anthropologist at McMaster University in Hamilton, Canada. "How resilient were these populations — or not?" The answers may even help biologists eke out lessons about how modern elephants might cope as habitats shrink and hunting pressures rise.